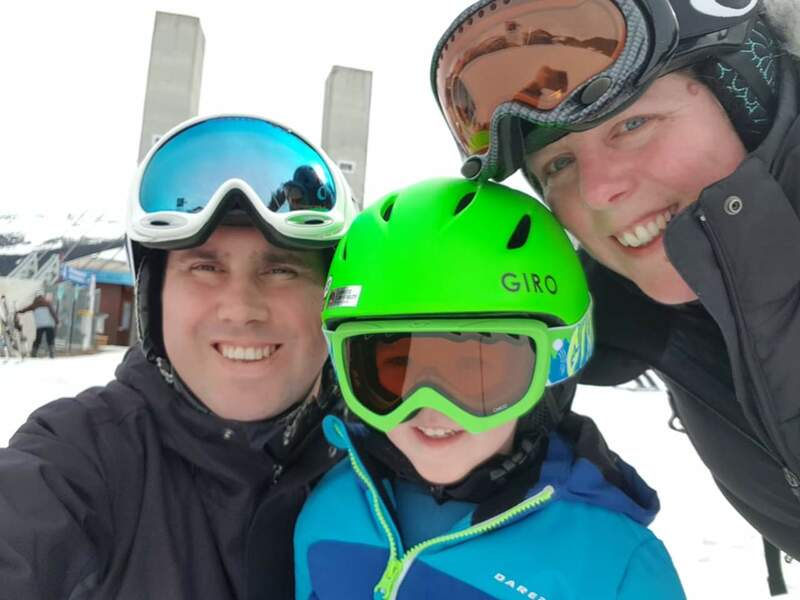 Blog » Our first family ski holiday! My husband, Sam, and I met skiing in France and over the past 12 years it has been amazing to share this hobby together! We have been on some incredible ski holidays, but for me it took a temporary stop, with my last ski trip being in February 2013, 6 years ago!! Going on honeymoon, being pregnant and then having Mini Mumbler meant that there was no skiing for me. With Mini Mumbler turning 3 this past summer, Sam was determined to get him on the slopes, so we could share our hobby together as a family! So, this summer, Mini Mumbler took to the dry ski slopes of Halifax Ski Slope. In the summer, it was beautiful with views across Calderdale and the sun beating down!! Being blown along the slope, with driving rain coming at you horizontally took commitment this autumn but hey, it meant that he was used to tough conditions!! We had an amazing instructor and before we knew it Mini Mumbler had enough strength to be dragged up the rope lift and ski down the slope in a ’pizza’! Planning a holiday takes two forms in the Mumbler household; last minute or planned to the nth degree! It was the 2nd option for this holiday; self-catering, hotel, chalet? Normal chalet company or one that was family orientated? Italy or France? And then once we had decided France … where? In the end we decided to treat ourselves a bit and booked a chalet ski holiday with family ski holiday specialist Esprit to Peissey in the Les Arcs area! From the booking process to arriving in resort, the operation was slick! Being in a chalet with four other families meant there were always other kids around to keep each other entertained. I’d brought along a few Orchard Toys mini games and they all joined in, surprisingly taking turns and not really arguing!! As there were 4 other sets of parents, you also didn’t have to be on duty the whole time either and we all just mucked in together to keep the kids entertained! It also meant that when everyone was shattered and headed to bed at 9:30pm, it really didn’t matter, and you didn’t feel like the unsocialable one not joining in and staying up drinking until the early hours! 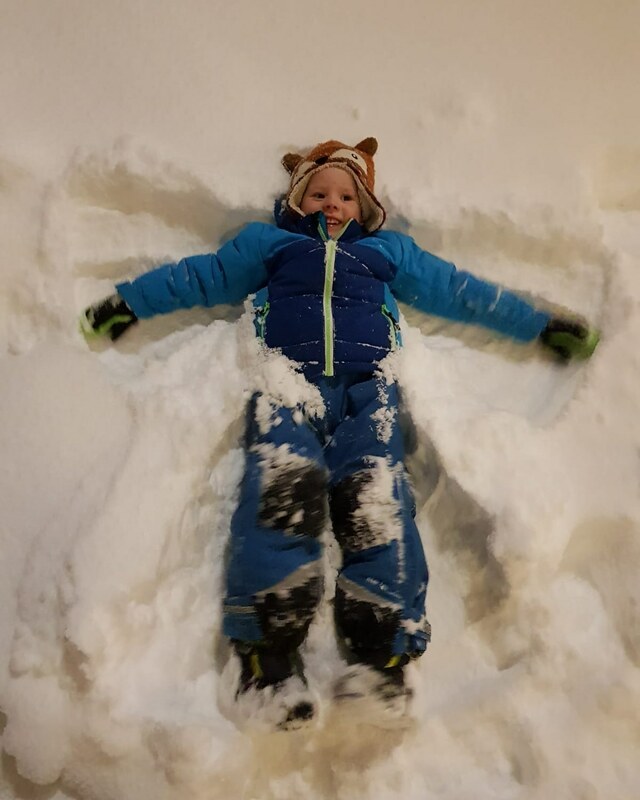 The childcare package meant you could get some adult skiing in and have a blast around the mountain! Mini Mumbler was collected by the Esprit childcare team for his ski lesson at 8:30am. They took him to it, a childcare member stayed in the ski lesson to help with small children duties such as wiping noses or going to the mountain loo and then they brought the kids back for lunch and we collected him at 2pm. 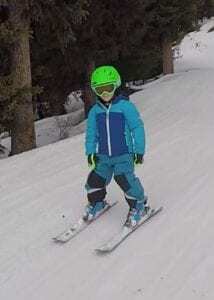 You could extend the childcare to cover the afternoon period, but we decided to take him up onto the slopes and he loved being able to show us the routes he had been on that morning! The childcare didn’t stop there either! There was a childcare member per chalet who would supervise children’s dinner. I found this amazing as it was the first time in ages, I could have a shower to myself; usually Mini Mumbler wants to come in too and I end up squashed to the side! The holiday was magical, with fresh snow falling, great blue-sky days, amazing food and a very happy Mini Mumbler!! Of course, no ski holiday to France would be without an issue …. Half way through and Mini Mumbler got red spots … and then blisters appeared … chicken pox! I’ll keep this experience to another blog, but wow airline chicken pox policies … I became an expert overnight! Will we be booking another Esprit holiday again? Absolutely!! I cannot recommend the holiday enough. I don’t think I’d really appreciated what the childcare element of the holiday was going to be like, but it is the first time that we have had a family holiday, Mini Mumbler has had his own little holiday and we have managed to have a holiday as a couple! It was amazing!! Someone asked me what the best age to take a child on a ski holiday would be … if you took them young, they would have a great time in all day childcare with loads of new friends and you would get a full day skiing. If they’re a little older, like Mini Mumbler, and they’ve done a bit of skiing in the UK, you get the advantage that you can take them up the slopes and feel safe that they’re not going to plummet off the side of the mountain as well as them having their own time in ski lessons. The only time I would not recommend is mid toilet training … some of the mountain loos are yuck and squatting them down to create yellow snow, with a load of layers isn’t easy either!! Even though it would have been nice for Esprit to give us an all-expense paid ski trip, we paid for it all by ourselves. All opinions are those of my own and they have not tried to bribe me with their amazing afternoon cake! Maybe in 10 years’ time, Wakefield Mumbler will have a following in the millions but until that time I think I’ll be paying for my ski holidays! If you’ve had an adventure holiday with your family, do let us know about it!